Rusophycus is always the first trace fossil I introduce in the Invertebrate Paleontology course because it is simple in form and complex in interpretation. It shows that a relatively straightforward process (digging down with its two rows of legs) can have had several motivations. Rusophycus even shows that more than one kind of organism can make the same type of trace. Rusophycus is also found in the Triassic, long after trilobites went extinct. (These were likely made by horseshoe crabs.) It is also good for explaining the preservation of trace fossils. The specimen above is “convex hyporelief”, meaning it is on the bottom of the sedimentary bed and convex (sticking out rather than in). This is thus sediment that filled the open trilobite excavation. 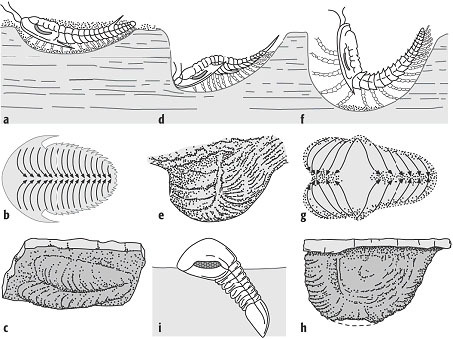 Trilobites making Rusophycus (from http://www.geodz.com/deu/d/Trilobita). James Hall (1811–1898) named Rusophycus pudicum in 1852. The image of him above is from shortly before his death (photograph credit: The American Monthly Review of Reviews, v. 18, 1898, by Albert Shaw). He was a legendary geologist, and the most prominent paleontologist of his time. He became the first state paleontologist of New York in 1841, and in 1893 he was appointed the New York state geologist. His most impressive legacy is the large number of fossil taxa he named and described, most in his Palaeontology of New York series. James Hall is in my academic heritage. His advisor was Amos Eaton (1776-1842), a self-educated geologist (he learned it by reading in prison!). 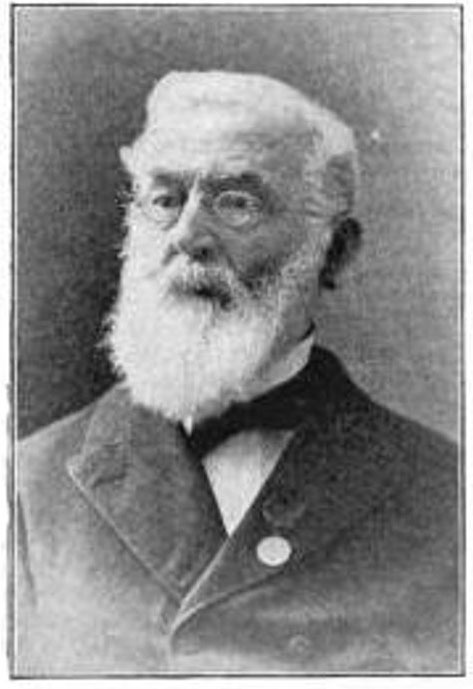 One of James Hall’s students was Charles Schuchert (1856-1942), a prominent invertebrate paleontologist. Schuchert had a student named Carl Owen Dunbar (1891-1979) — Schuchert and Dunbar were coauthors of a famous geology textbook. Dunbar had a student at Yale named William B.N. Berry (1931-2011), my doctoral advisor. Thus I feel an intellectual link to old man Hall above. Baldwin, C.T. 1977. 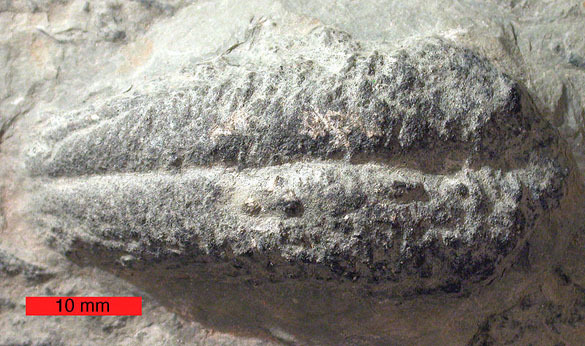 Rusophycus morgati: an asaphid produced trace fossil from the Cambro-Ordovician of Brittany and Northwest Spain. Palaeontology 51: 411–425. Donovan, S.K. 2010. Cruziana and Rusophycus: trace fossils produced by trilobites … in some cases? Lethaia 43: 283–284. Hall, J., Simpson, G.B. and Clarke, J.M. 1852. Palaeontology of New York: Organic remains of the Lower Middle Division of the New-York System. C. Van Benthuysen, New York, 792 pages. Back again. I have been looking at Rusophycus in Silurian/Devonian deposits in Lothian, Scotland. Actually in beach pebbles but I am assuming they are from the local rock. I can see local Rusophycus. It fits well with photographs (and yours). However, the generalised diagrams bear little relation to the real thing. No great quibble with that but wonder how people get from the fossil to the diagram. Ref. ? I see a lot of other stuff which appears to be associated with Rusophycus since there is not much there. I see what appear to be dislocated appendages for example. I see “larvae” (your Fig i) whose general anatomy is very different (no compound eyes for example). I see eggs with diminutive tails. They may be something else but they are associated with Rusophycus – on it, around it, around the place. I see vertical burrows (5 mm long). I can work out a life history but without more information this may be totally imaginary. I am wondering if there is any detailed information on these things (appendage, eggs, larvae, burrows). I need photographs and not fanciful diagrams. It is easy to say “this is a trilobite” and then apply it to Rusophycus. There appears to be a vast gap between the actual fossils and peoples’ imaginings. Any suggestions? I will check the ones you give. Checked reference. The problem is that I do not have access to these journals. I am not part of a university. If I was I probably would not be contacting Woosters. The fossil information surely is for those of us who are outside the system. We are the amateurs who break new boundaries. We are not controlled by institutes or money. Our source is the Google but this is limited. We need free information. I have no idea how I can separate the glabella from the egg capsule described by Fortey & Hughes. Perhaps two of them got it wrong. The above photo of Rupeicum tell me next to nothing. Are we being shown the upper or lower surface? From the figure below it I assume the lower surface since legs can be just about seen. What does the upper suface look like? I have been looking at an unkown (to me) species of Rusophycus in Scotland. A friend tells me this is the name for a red seaweed which makes sense. Rufo means red and phyco means seaweed as in phycology. Makes sense to me. Perhaps Hall was having a senior moment or he thought it was a piece of seaweed. That would take the shine off him. My guess is the the fossil sits in a dawn somewhere and no one is allowed to examine at it. Looking at the photo again there is some red (pin) in it – iron ore I imagine. The body (with legs) is very long. So what we (and Hall) are looking at is a specimen without a head. One would not expect an animal to have a geat big groove running through its head. Also and here is a first, is the three round bobs with halos around them. These are about 0.5 mm in diameter. The could be eggs. It is where one would expect them to be. This contradicts Forey and Hughs and makes better sense. Rhodophyta is a red seaweed. Confusion over the names Rufophycus and Rusophycus. I like that. I can find references to Rufophycus on the Google but not Rusophycus. I cannot of course access the references given above so I cannot check Rusophycus. The problem is Rufophycus is a trilobite and is similar to the species shown in the diagram above. Cuziana, of course, is not a zoological species but a track. It is like saying a human foot print is a species. Rusophycys is probably not a species but a track. That would be fun.